If you hark back to the days when your Easter Eggs used to have something exciting inside, then Buttermilk has the perfect offering for 2018! The family-run Cornish firm is offering handmade Easter Eggs in three new flavours- each filled with a special treat inside. Each is lovingly made to create the perfect gift for the friend or family member who would love something different at Easter. The first is a fabulous Strawberry Bellini Easter Egg – a fruity, fizzy treat that tastes like your favourite cocktail. The white chocolate egg is infused with freeze-dried strawberry pieces and a little popping surprise. Inside, you’ll find Buttermilk’s new Strawberry Bellini Fudge – the perfect buttery, crumbly accompaniment to a glass of Prosecco and strawberries. Next up is a stunning Caramel Sea Salt Milk Chocolate Easter Egg. Inside the milk chocolate egg with butterscotch decoration, you’ll find caramel sea salt fudge infused with tiny flakes of sea salt for a perfect burst of salt combined with caramel sweetness. 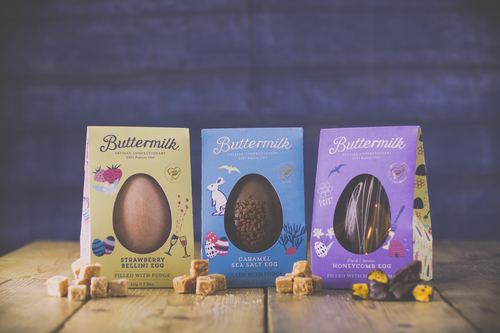 Lastly, Buttermilk has launched a Dark Chocolate and Honeycomb Easter Egg. This Belgian dark chocolate egg is drizzled with white chocolate. Open up the two chocolate halves and inside, there’s a melt-in-the-mouth honeycomb dipped in dark chocolate with real honey and a dash of sea salt. 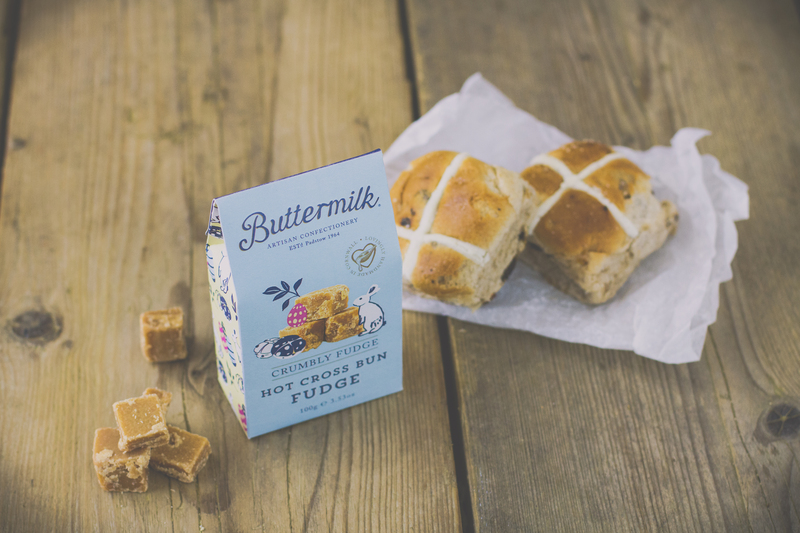 For a smaller but equally tasty treat, Buttermilk has taken Hot Cross buns for its inspiration and created a fantastic new crumbly fudge that really does taste like Easter. All are gluten-free and cost £11.99 each. The Hot Cross bun fudge costs £2.99. A family-run business, born and bred in Cornwall, a love for everything sweet has been inspiring Buttermilk’s artisan confectionery for over half a century. Their story began in 1964 with the opening of their first shop in Padstow, and although demand for their fudge has grown and grown, their award-winning treats are still lovingly handmade by craft confectioners. Staying true to their heritage, the skilled team at Buttermilk can still be found using traditional copper pans over open flames, carefully blending ingredients to create indulgent, award-winning treats.